Aside from the house lights fading down and cheers erupting into the cool summer night air, country legend Willie Nelson’s on-stage entrance at Kansas City’s Starlight Theatre was gloriously unceremonious. Coming after a riveting set from rising alt country artist Jason Isbell and Alison Krauss’ nostalgic bluegrass affair, Nelson’s work was austere from the start. Opening with “Whiskey River”, he firmly stood in place with his weathered guitar Trigger and nasally sang “whiskey river don’t run me dry” before his Family Band had set up on stage. Rather than dwell on the slinky vamp of “Still is Still Moving to Me”, he spit out lines like they were last rites. At 81 years old, Nelson has every right to play up his legend. He could coast on past glories and no one would blame him. But not once in his near two-hour show to a sold-out crowd did he kick up his cowboy boots. When classics came, Nelson never lingered on them for long. 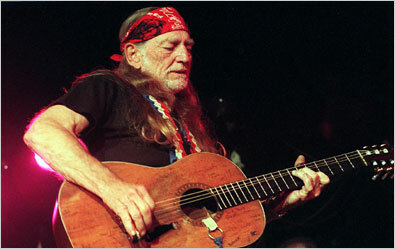 Most artists would anchor sets or close with a song like “Funny How Time Slips Away”, not Willie. He has enough songs for 20 shows and is blessed with the luxury of tossing out greatest hits like they were garbage. He didn’t afford the bluesy ballroom number its proper denouement; choosing instead to leapfrog into the aching “Crazy”. I personally prefer Nelson’s effort to the Patsy Cline affair and last night reminded me why. His punctured whine fully conveys the desperation of “I’m crazy for trying” and live the line is devastating. But even “Crazy” wasn’t allowed to luxuriate at Starlight. Nelson and the Family obliterated it into dust with the walloping “Night Life”. Mickey Raphael’s harmonica wailed and Nelson soloed with the steely-eyed intensity of a contract killer. The admission “it ain’t no good life” would’ve been toothless without their full-committal. While Nelson and the Family’s allegiance to the material was mesmerizing throughout, the show’s middle was the most spellbinding. “Georgia on My Mind” brought the crowd to a reverent hush with just the wobbling incantations of “Georgia, Georrrgia.” Bobbie Nelson’s work on the keys was punctuated, affording Willie room to sweetly sing his old song. In the right hands the number has the power to stop anyone in their tracks and it was clearly in the right hands with Nelson. It was “Always on My Mind” though that truly won the night. If the phrase “hindsight is 20/20” didn’t exist before Nelson cut his version of the Brenda Lee song in 1982, it would’ve been invented shortly after. Few song narrators have ever sounded as wrecked as Nelson in “Always on My Mind”. Everything he should’ve done was blindingly obviously, but he ignored all of it. Watch Nelson in the song’s rudimentary video. Around the 1:40 mark his eyes repeatedly look away after he confesses “I just never took the time.” It’s the look of a man who knows he’ll never get her back. She had every right to leave and fully executed said right. Despite the song being set to a slightly slower tempo live, Nelson kept in that nervous flitting. More than his defiant soloing in new track “Bring It On” or picking in the eerie border town tune “I Never Cared for You”, his nervousness was the most bone chilling. For a master wordsmith, it’s oddly hilarious that what left the biggest mark was a simple action. “Odd” is what has best described Nelson since the beginning though. Crossing over from Nashville songwriter to singer in the early 1960s was “odd.” Releasing an insular concept album about a murderous preacher and having it go double-platinum is “odd.” Ending the night with the one-two punch of goofy pot ode “Roll Me Up and Smoke Me When I Die” and Hank Williams country gospel standard “I Saw the Light” is “odd.” He’s not “The Red Headed Stranger” as has long been suggested. He’s genuinely strange. And without his peculiarities, country music would be far less interesting.